A small town is stalked by a mysterious murderer connected to an abandoned mansion that was once the site of an insane asylum. Diane Adams recounts the story of how Wilfred Butler returned to the house he built in Arlington County, Massachusetts on Christmas Eve, 1950 only to be mysteriously set on fire before burning to death in the snow outside. The town ruled his death as accidental. Having converted his home into a mental asylum, Butler’s will left the house to his grandson Jeffrey on the condition that it remain untouched to remind the world of its inhumanity and cruelty. Twenty years later, Jeffrey contracts attorney John Carter to sell the property. Carter arrives with his mistress Ingrid and meets with the town’s principals: Diane’s father Mayor Adams, communications director Tess Howard, “The Patriot” newspaper editor Charlie Towman, and Sheriff Bill Mason. Carter extends Jeffrey’s offer for them to purchase the house at the undervalued price of $50,000 and gives them until the next day to make a decision. News breaks on the radio about an escaped inmate from Margaretville State Hospital. Diane drives past a man stranded on the side of the road, but she does not stop. The man angrily breaks his windshield with a tire iron. Carter and Ingrid stay the night in the Butler house while a black-gloved figure stalks the premises. During the night, Carter and Ingrid are brutally murdered with an ax. Afterwards, the killer calls Sheriff Mason and lures him to the house. As the switchboard operator, Tess takes over the call and the voice on the other end claims to be someone named Marianne. Marianne tells Tess to tell the mayor and the others that she is waiting for all of them in her father’s house. The man from the side of the road steals John Carter’s car from outside the Butler house and drives it to the Adams residence looking for the mayor. Diane pulls a gun on him when he enters. The man shows Diane his identification to prove that he is actually Jeffrey Butler. Diane joins Jeffrey in trying to find someone in town who can help him get inside his locked house. Sheriff Mason visits Wilfred Butler’s grave and finds Butler’s diary lying next to the tombstone. An assailant then kills the sheriff with a shovel. A short time later, Jeffrey and Diane find the sheriff’s abandoned car and sunglasses at the cemetery. Considering the phone calls and the other missing townspeople, the couple begins to suspect that something strange is happening at the Butler house. Tess arrives at the Butler house and is killed by Marianne. Back at The Patriot, Diane looks through old newspaper articles on the history of the Butler house. Diane discovers that Wilfred Butler restored his home in 1927. His wife Catherine died of tuberculosis in 1930. In August of 1933, Wilfred Butler’s 15-year-old daughter Marianne was cruelly attacked and raped. On May 2nd, 1934, Marianne gave birth to Jeffrey. In early 1935, Butler house was turned over to a Doctor Robinson as an asylum for mental patients. Wilfred committed his own daughter to the asylum, but Diane discovers that Towman cut out the remainder of the story from all of the newspapers. Jeffrey returns for Diane and they set out for the Butler house. They find Towman’s car in flames on the road before Towman emerges from the shadows and Jeffrey hits him with the car. Jeffrey examines Towman’s body and discovers that his hands were cut off. Diane blames Jeffrey for killing Towman. Mayor Adams takes another phone call from Marianne claiming that a reunion is being staged at the Butler house. Mayor Adams arms himself with a gun and begins making his way to the mansion. At the house, Jeffrey finds his grandfather’s diary. In it, he learns that Wilfred fathered Jeffrey with his own daughter, Marianne. Wilfred turned the house into an asylum with the hope of helping Marianne cope with her emotional trauma. Believing Dr. Robinson and the rest of his staff to be cruel and self-serving, Wilfred eventually released all of the patients and they subsequently killed everyone. Wilfred escaped, but he believed that his daughter died when the inmates confused her for someone on staff. The inmates went on to hide their crimes by assuming new identities as prominent townspeople including Towman, Tess, Mason, and Mayor Adams. Wilfred did return to the property in 1950, but the man who burned to death was actually a squatter that Wilfred found inside and set on fire. Diane confronts Jeffrey. Mayor Adams arrives. Believing each other to be the killer, Adams and Jeffrey pull their guns and shoot one another. Wilfred Butler emerges from the shadows and confronts Diane, confusing her for being Marianne. Diane grabs Jeffrey’s gun and kills Wilfred. One year later, Diane watches as a bulldozer pulls up to demolish the house. “Silent Night, Bloody Night” is not as “Christmas-y” as its name would imply, which is likely at least one reason why it was initially released with the less seasonal title, “Night of the Dark Full Moon.” Without a killer Santa Claus or any plot-motivated holiday theme, the December setting is largely incidental, necessary mainly to justify snow on the ground. A carol or two can be heard in the background and one character is briefly seen wrapping presents, but the story could take place in June or July just the same. Still, “Silent Night, Bloody Night” (“SNBN”) would make a perfect opening feature on a double bill with Bob Clark’s 1974 classic “Black Christmas” (review here). Even though the two films are unrelated as pure holiday horror, they share thematic elements in common as precursors to the late 70’s, early 80’s boom in slasher cinema. There are those quick to raise an index finger and say “not so fast” to laud “Black Christmas” whenever John Carpenter’s “Halloween” (review here) is mentioned as a jumpstart to the genre. A similar case could be made for “SNBN” when referencing Clark’s film. Both films feature creepy phone calls, first person POV perspectives, twisted family trees, and outdated scenes involving phone bank switchboards as memorable hallmarks. Yet while “Black Christmas” became hailed as a contemporary classic, “SNBN” fell into public domain obscurity. Among the reasons for that disparity is no doubt the fact that “Black Christmas” is a much more accessible film by mainstream scary movie standards. 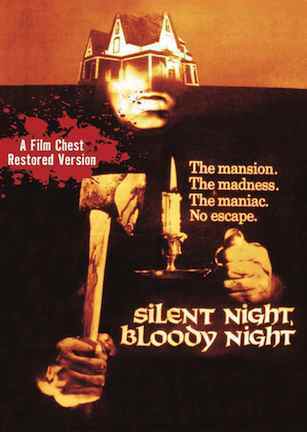 “Silent Night, Bloody Night” is an unusual mix of old dark house thriller, small town secret mystery, and ax-murdering mania from a time in slasher history when dramatic theatricality went beyond snarky one-liners and creative kills. It is continually engaging as a gradually unfolding horror whodunit, though it surely fails to grab some viewers because of that slow pace, and because its plot is probably more complicated than it needs to be. The short summary is that in an effort to help his troubled daughter, Wilfred Butler welcomed doctors into his home and eventually turned his house into a mental asylum. Twenty years later, Butler returned to the house after a mysterious absence only to be set on fire and burned to death in a Christmas Eve incident ruled to be an accident. Twenty more years later, Butler’s grandson Jeffrey decides to sell the long abandoned house back to the town that wants it destroyed. But a mystery figure in the house going by the name “Marianne” has plans for the townspeople involving an ax and their true connection to the Butler house’s sinister past. With various threads relayed via flashbacks, diary readings, newspaper narrations, and present day scenes spanning the 1930’s, 1950’s, and 1970’s, “SNBN” already has plenty going on within its 84 minutes before introducing a cargo net bursting with red herrings. In addition to the identity of “Marianne,” the mystery of Wilfred Butler’s death, and the sudden reemergence of his grandson Jeffrey, there are also side stories involving a philandering estate attorney and an escaped inmate from a nearby mental hospital. Changing directions almost as much as it changes scenes, “SNBN” has a lot of story on the table, though not all of it adds up to a meaningful payoff in the end. Regardless of its relative impact, “SNBN” is a film unafraid to take chances in its effort to stand out. Its cast alone is proof. Mary Woronov features prominently as just one of several Andy Warhol superstars making an onscreen appearance, although the others are bit cameos as asylum inmates and dinner guests. In a move that is either brilliant or baffling, “SNBN” takes film legend John Carradine, an actor partly known for his distinct voice, and makes him a mute who communicates by ringing a desk clerk’s bell. That’s just one Twin Peaks-like eccentricity assigned to the roster, another being a pillbox hat-wearing woman with no less than forty occupied birdcages populating her home. This is quirky behavior befitting a cast of characters where almost no one is who they say they are. It’s a clichéd assessment to assign, but “Silent Night, Bloody Night” is a sign of its filmmaking times. Enjoyably odd performances and a story that is slow but never dull make for an interesting film, even if the overall execution is questionable. Tolerance for seventies cinematic stylings certainly helps, though “SNBN” does come up short in enough categories related to quality that it is understandable if it does not make the annual rotation of fright films to revisit every December. February 11, 2014 by Ian Sedensky.